It won’t have escaped anyone’s notice that Conversation Analysis has been very successfully (and some would say belatedly) spreading its wings to encompass people’s interactions with things as well as other people. In this illuminating account of one of Finland’s most active research groups, Antti Kamunen tells us what CA can tell us about multi-tasking (and vice-versa). iTask (1st September 2015 ‒ 31st August 2019) is a new international research project funded by Academy of Finland and led by Professor Pentti Haddington. Based at the unit of English Philology at University of Oulu, our project takes a fresh angle on both multitasking and social interaction by studying interactional multitasking. We started in December 2015, when we (Antti Kamunen, Sylvaine Tuncer, Pentti Haddington, Anna Vatanen) all got together for the first time in Loughborough to plan and discuss the project. We have complementary backgrounds and interests; our PI Pentti and I are focusing on multimodality and English linguistics, Sylvaine (postdoctoral researcher) brings the research a sociological perspective and specialises in workplaces, and Anna (postdoctoral researcher) will bring her expertise on general and Finnish linguistics. We are also very fortunate to have a network of distinguished professionals as collaborators, including Lorenza Mondada (University of Basel, University of Helsinki), Gene Lerner (UCSB) and Charles Antaki (Loughborough University). I spent six weeks at Loughborough University visiting Charles Antaki and Liz Stokoe at the Department of Social Sciences, with another two weeks’ stint in late March. What do we mean by interactional multitasking? A generalized way of describing multitasking would be to say it means managing two or more separate activities / courses of action that take place in parallel. One of our tasks is to distinguish how we define interactional multitasking. It can be understood as interaction being one element in a multitasking situation (e.g. talking with someone while doing the dishes), as multitasking with interaction (e.g. holding up two or more separate courses of interaction in parallel), or as a combination of the above. The sociological domain: What social actions and activities are used for interactional multitasking? How are these actions designed in interaction? 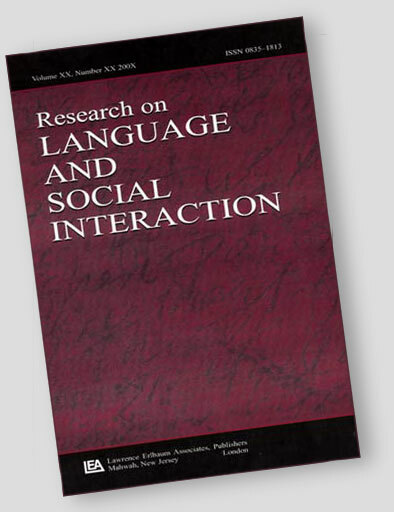 The linguistic domain: What linguistic (morphological, lexical, phrasal, syntactic or prosodic) formats or constructions are deployed for executing social actions that achieve interactional multitasking? How are they used to coordinate interactional multitasking? The multimodal domain: How do social participants use their body, gaze and gestures for interactional multitasking? For example, how do they use multimodal resources of communicating their involvement in or coordinating their actions between separate activities? Large corpus Answering these questions requires a large and versatile corpus of audio-video recordings made in naturally occurring real-life situations, and thus also a method for analysing such data. This is why multimodal conversation analysis was chosen as the main research method; it can be used for analysing in great detail how participants use linguistic, embodied and other interactional and multimodal resources for multitasking. For research on interactional multitasking specifically, the project builds on existing knowledge of the sequential organisation of social interaction (Schegloff, 2007), participation (Goodwin & Goodwin, 2004), involvement (Goffman, 1963) and multiactivity (Haddington, Keisanen, Mondada & Nevile, 2014; Mondada, 2012). The data we use in the project are video recordings of ordinary everyday interaction collected in different workplace and domestic settings. We already have a collection of approximately 130 hours of existing recordings, and we are to collect an additional 30 hours of new recordings. We are especially interested in how interaction is managed in busy situations, such as doing household chores in a family with children or by colleagues managing working in a shared office. Through precise and detailed analyses of how talk and bodily behaviour feature in interactional multitasking, we aim to provide new findings on how people multitask in real-life situations in and through interaction. The project will identify social actions that are used to carry out interactional multitasking. These might be actions that are already familiar from other interactional contexts (such as e.g. requests used for accomplishing suspensions), but the analysis will probably also reveal actions that have not yet been identified or described. All in all, we expect the project to show that talk, bodily behaviour and interactional collaboration are not irrelevant to multitasking. You can keep an eye on us by following our iTask website where we will update our progress and findings. Goodwin, C. & Goodwin, M. H. (2004). Participation. In A. Duranti (Ed. ), A Companion to Linguistic Anthropology (pp. 222-244). Maldan, MA Blackwell. Haddington, P., Keisanen, T., Mondada, L. & Nevile, M. (Eds.). (2014). Multiactivity in social interaction: Beyond multitasking. Amsterdam/Philadelphia: Benjamins. Mondada, L. (2012). Talking and driving: multi-activity in the car. Semiotica, 191(1/4), 223-256. Schegloff, E. A. (2007). Sequence organisation in interaction: A primer in conversation analysis (Vol. 1). Cambridge; New York: Cambridge University Press.